Studying Abroad can provide terrific opportunities to improve and solidify your language skills, broaden your cultural understandings and spark your involvement as a global citizen. The experiences gained through time abroad will be life-changing, look great on a resume, and create great memories to look back on! 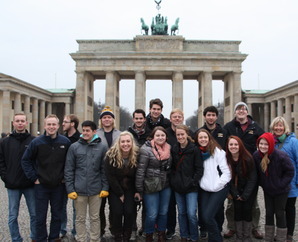 The Gustavus Study Abroad office is located in the Center for International and Cultural Education (https://gustavus.edu/cice/studyabroad/). Gustavus sponsors programs around the world and will help you in every step of your journey abroad. Programs in German-speaking countries (Germany, Austria and Switzerland predominately) can be found by searching through the database (http://gustavus.studioabroad.com/). The CICE will help to guide you through the application process, requesting financial aid, and working to transfer classes back to Gustavus (yes, even towards your majors here!). Faith, Love, and Music in Germany: Exploring Vocation in the Footsteps of Luther, Bach, and Bonhoeffer (Gustavus-offered) visiting Berlin, Erfurt, Heidelberg, Leipzig, Weimar and Wittenberg, Germany. Berlin Yesterday and Today: From the Third Reich to German Unity (Gustavus-sponsored, through UMAIE, course code 4801) visiting Berlin and Weimar, Germany. Eastern Europe: Cultural Trauma, Communication and the Camera (Gustavus-sponsored, through UMAIE, course code 4783) visiting Frankfurt and Hamburg, Germany. The Chemistry of Brewing in Belgium and Germany (Gustavus-sponsored, through UMAIE, course code 4796) visiting Munich, Germany.